A couple months ago I was asked to join 4 gorgeous + very talented ladies at a photoshoot for The Hollywood Reporter’s amazing new site, Pret-a-Reporter, which we love. I was terrified AND excited as I don’t usually sit in front of the camera! I’m more of a behind-the-scenes kind of gal. But when they told me about the concept I wanted to be a part of it. They asked each of us to channel an Old Hollywood Starlet and told us the headline of the article was going to be “Digital Starlets”. That was really exciting, but THEN the news got better. 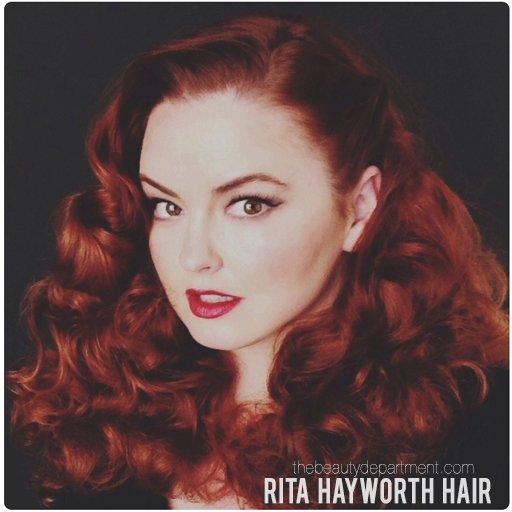 They told me that I got to channel Rita Hayworth. Melt. My. Heart. She’s always been my number one. The shoot was loads of fun and we’re beyond grateful that they included The Beauty Department in this story. You can view the images with all the other lovely ladies right here. I also thought it would be fun to do a tutorial on how I did my hair for the shoot, so here we go! Shampoo + lightly condition. Don’t use a heavy conditioner or mask before attempting this hairstyle as it might weigh the curls down. Have you invested in a new mousse yet? It’s back and better than ever. There are lots of new mousses on the shelves that are soft and pliable, not crunchy. Work some through the root first and then down toward the ends. I gave it a nice brushing once the mousse was in to ensure even distribution. You DON’T want mousse clumps. 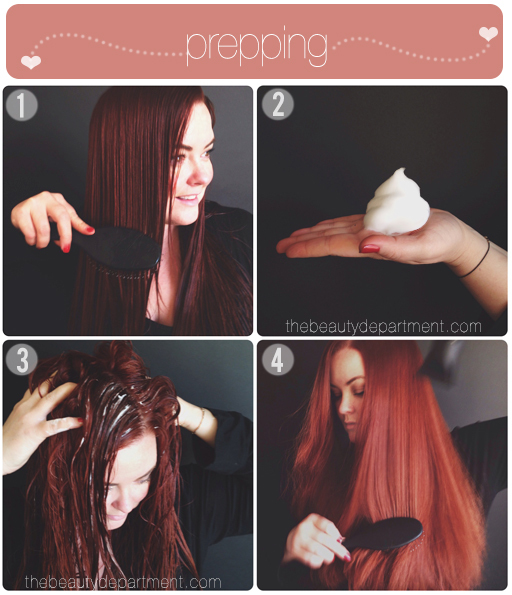 Rough dry the hair using a flat brush. I have strong natural waves, borderlining on curly. You don’t need it to be smooth. In fact, I like mine to be a little puffy and frizzy because I feel like it holds the curl better in the long run. If you straighten it first it might fall flat quickly. Try a section first so you understand how your hair will react to the curl. I did one here so you can see what the hair should do. Curl, cool, brush, bounce! That’s what you want. I start at the top and work my way down with the curling iron. I like to make sure the top and the middle get just as much heat as the ends so they don’t fall flat. I used a 5/8″ iron for this whole set. Seems small, but trust me you don’t want to use anything larger than 3/4″ for the curl or it will end up more like Veronica Lake Waves, which are great, but not the point. Let the curl cool until the hair feels cold. When you do your whole head, you’ll want to pin each curl and let it cool, but for this one I didn’t pin it. 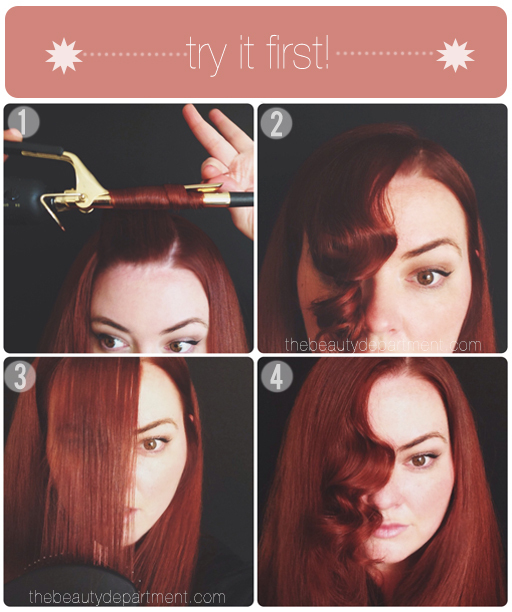 Brush out the curl until you see the pattern form. It should spring up and start to look like this. Once you get the hang of it, you’re ready to curl the whole head. 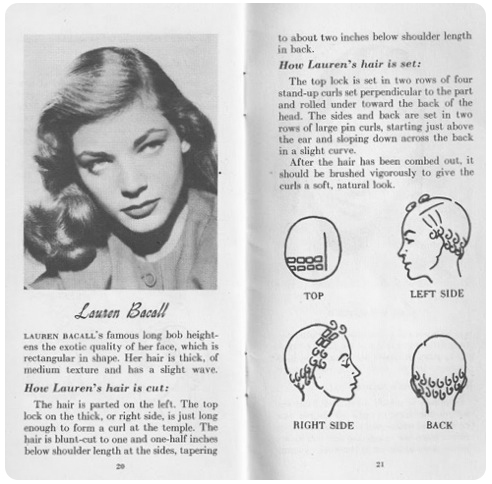 When I started to fall in love with vintage vibe hair, I started buying a lot of these old books with written tutorials. I tried to make you one below so you could see the pattern I used for this set. Create a side part on whichever side you prefer. This looks best with a side part rather than a middle part in my opinion. Curl the heaviest side first. 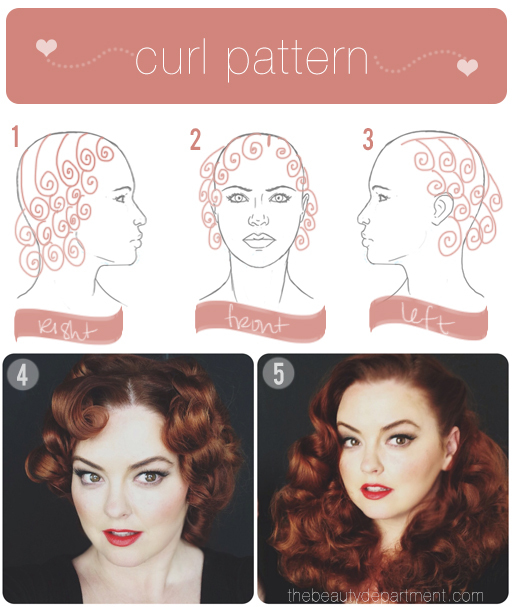 Start at the top and pin the curls into place in the pattern above. Work your way to the bottom. The front pieces are the most important because they’re going to define the shape more than anything so be very precise with the front curls. Work your way around to the other side. You want to curl everything down and toward the face. Put your makeup on and get dressed while your curls cool. The colder the better. Now brush out the whole head. Keep brushing until you start to see the pattern form. Once you do, start adding hairspray. You can either tuck the hair behind your ear or you can twist it and pin it like I did using a large bobby pin. Totally up to you! Pret-a-Reporter is also doing a sweepstakes which you should check out HERE! Thank you to our friends at Pret-a-Reporter for partnering with us on this post and including us in the story!